The Village of Hempstead and Theta Iota Omega Chapter have shared a special partnership in improving the lives of Hempstead residents for 50 years. Many chapter-sponsored community service initiatives and events have greatly impacted the Hempstead community. Dr. Watkis has lived on Saint Regis Place for 52 years and is a charter member of Theta Iota Omega Chapter. Her commitment to the community, beautifying the neighborhood and helping others has inspired Hempstead residents and members of the Theta Iota Omega chapter for generations. 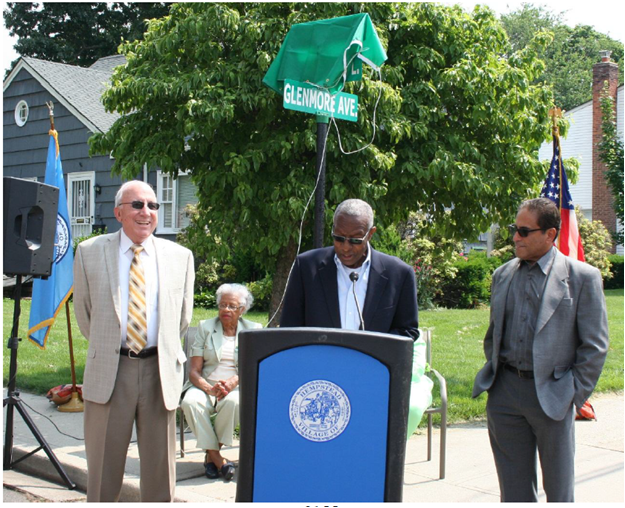 This street dedication recognized the Theta Iota Omega Chapter and their dedication to helping the residents in the Village of Hempstead access opportunities and succeed. Village of Hempstead Deputy Mayor Luis Figueroa; Kiona P. DeWitt, Theta Iota Omega Chapter President; Dr. Marion Fleming, Charter Member; Doris White, Charter Member; Wilma Holmes Tootle, Alpha Kappa Alpha Sorority, Inc. International Sisterly Relations Chairman; Leah E. Watson, Theta Iota Omega Chapter, 50th Anniversary Chairman; Village of Hempstead Mayor Wayne J. Hall Sr. and Village of Hempstead Trustee Don Ryan stand to honor local community leader and Charter member Dr. Terrecita Watkis (seated) and Mr. Roy Watkis (seated). The Village recently dedicated Saint Regis Place to Alpha Kappa Alpha Sorority, Incorporated, Theta Iota Omega Chapter in honor of the organization’s 50 years of service. (L-R) Village of Hempstead Mayor Wayne J. Hall Sr. (center) welcomes the Theta Iota Omega Chapter, congratulating them on their dedication to helping Village residents access opportunities while Village of Hempstead Trustee Don Ryan and Deputy Mayor Luis Figueroa look on. 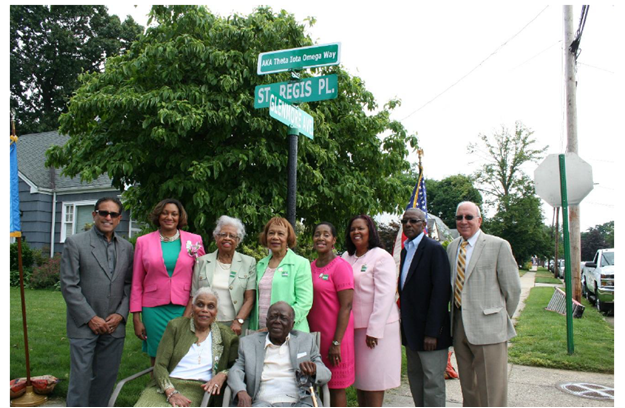 The Village recently dedicated Saint Regis Place to Alpha Kappa Alpha Sorority, Incorporated, Theta Iota Omega Chapter in honor of the organization’s 50 years of service and to local community leader Dr. Terrecita Watkis.